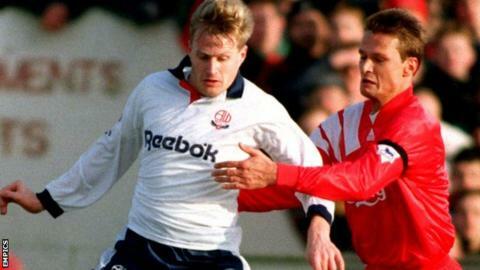 Bolton hope to repeat their victory at Liverpool in the FA Cup fourth round this weekend, just as they did in 1993 when they won in a third-round replay. After a 2-2 draw at Burnden Park, third-tier side Bolton went to the then-FA Cup holders and beat them 2-0. Scottish striker John McGinlay scored for the Wanderers in both games as they caused a memorable upset. "Going to Anfield and winning the game was far better than winning at Burnden Park," he told BBC Sport. "We got more exposure from it and it did the town a lot of good as well as the team." A Liverpool team including England internationals Rob Jones and John Barnes, Scotland defender Steve Nicol and a future Champions League winner in Steve McManaman were rescued when Ian Rush scored late on in the first match, but were thoroughly outplayed at home by Bruce Rioch's side. "I think the biggest acclaim to ourselves was at the end of the game we celebrated with our supporters - and we turned around and everybody in the Kop was applauding us and clapped us off the park," added McGinlay. "The done thing for a lower-league team was to come and maybe try and kick you off the park, but we actually played football in the right way. "They couldn't deal with David Lee. That's the best 90-minute performance I've seen from a Bolton player. "He tore Liverpool to shreds on the night. Myself and Andy Walker got the plaudits because of the goals, but David Lee made us tick that night." Liverpool striker Robbie Fowler got his first taste of first-team action as Bolton won at Anfield - it was his first appearance on the bench for the Reds. The Inverness-born former Scotland international had a nomadic career representing 15 clubs, but spent his longest period at the Whites, scoring 87 times in 192 appearances. McGinlay, now 50, is still warmly thought of in the town. When he was coaching in the United States and people asked where he was from, he used to say Bolton. He also bought the Original Bay Horse pub in Horwich last year. Current Bolton boss Neil Lennon, 43, has been made well aware of how famous the game is to the club. He said: "Obviously it has very special memories for the Bolton public and the ex-players - there is that sort of extra significance with it being in the cup as well. "We know we can compete, I've got players here who've played in the Premier League and are in really good form. "That might not be enough at the end of the day but we'll certainly go there and not sit back." Since replacing Dougie Freedman in October, Lennon has guided Wanderers out of the Championship relegation zone and they have won four of their last six games. "Neil's got the boys believing again and playing for the shirt," stated McGinlay. "It's actually very scary - the similarities to this team and the way they've started the season to how we did way back then. I've just got a feeling we might get the same result again as well."